HMD Global has a lot to share with the world this month, as the Finnish company announced last month it will hold a launch event on October 4 in a couple of European cities. At the moment, we don't know whether HMD will announce the global availability of the Nokia 5.1 Plus and Nokia 6.1 Plus, or it will unveil a new device. However, that's not the only important event aimed at Nokia fans, as HMD has just confirmed yet another event, which will take place in India on October 11. 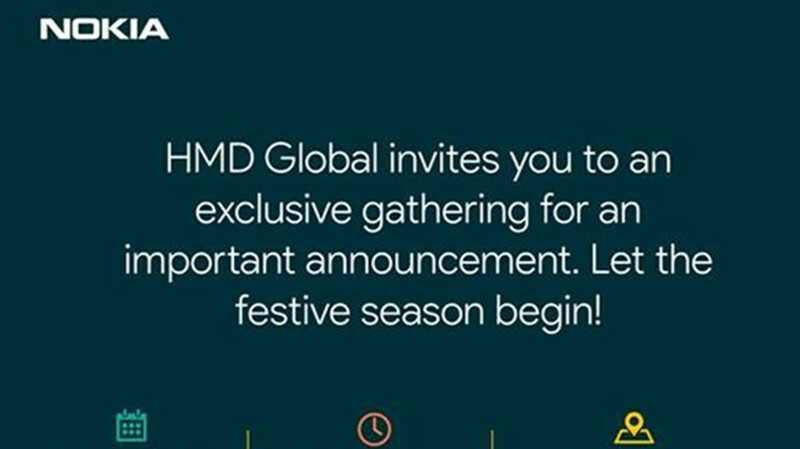 The invitation says that HMD Global has an “important announcement” to make and to “let the festive season begin,” but that doesn't suggest that we'll be seeing a new device. Judging by what the invitation says, it's more likely that a new device will be announced on October 4 rather than next week. Now that rumors claim the Nokia 9 has been delayed for early next year, the only new phone that HMD might announce is the Nokia 7.1 Plus, a mid-range smartphone packing a Snapdragon 710 processor. The good news is we won't have to wait too long for HMD's first big reveal, which is slated for later this week. As far as the October 11 event goes, it's highly likely that this will be entirely related to the Indian market, so there's that. I’m here for it! Can’t say enough how I’ve been impressed with HMD. They’ve been putting out some great midrange smartphones with nice specs and great bang for your buck, and have been amazing with monthly security updates and full OS updates. They are one of the best Android OEM’s when it comes to supporting their smartphones. And while I’m eager for a Nokia branded high end flagship from HMD, what they have out now and have been releasing for the low to upper midrange has been more than enough to get the job done. Looking forward to this. Another non-flagship, mid-range outing from these guys. Huawei has made as close to a modern Lumia 1020 successor these days and I don't care what HMD is doing until they do a proper flagship device with a top tier camera the right way. If Huawei can do it surely they can. Or maybe they are taking their time to make sure they get it right? How long did it take Huawei to out what was close to thr Lumia 1020 successor. They didn’t do it overnight. You need to remember that HMD is still a young company, and even with the Nokia name on their smartphones, they still have to build up trust amongst consumers and a proper buying base for their offeings. They are doing it, but it takes time to solidify a proper buying base. Them rushing to put out a flagship like toy want could prove to be a big mistake. Just look at Essential. For however good it may be, let’s face it, it flopped. Look at the Pixel line. Bug infested mess. Look at the Android stalwarts like HTC. Going down fast. Let HMD take their time to get it right. Or HMD just want to compete in the mid-range class. No need to compete in the flagship area if the money is in the mid-range. I own nokia 7 plus, the over-all usage is good and don't give me major headaches. The only gripe I have is the hard corners but the build makes you confident not to put a jelly case. While I do believe that they do want to and will release a high end flagship, I believe that HMD realizes that the high end flagship market is saturated, and that they will be able to maximize their profits in the low to upper midrange segment of the market, and that’s not a bad thing at all. That’s smart business. I don't even own or have ever owned a Huawei phone. All I'm saying is that HMD/Nokia pioneered the technology for an excellent flagship camera experience and I just want something to get excited about FROM THEM. They've put out a bunch of entry level and mid-range products already. I'm an LG fan by the way. They also had to wait to regain the rights to use/own things like Pureview, remember? And those entry level to midrange products are a smart move, as it it’s what’s providing their growth. Flagships don’t provide as much growth for Android OEM’s. Only Apple has it like that, and even their sales are stalling now. Oh come on, not another Nokia 8.1 plus or something..... give us a great camera flagship. I agree. Stop with the derivative releases and give us a flagship. If they have to stop, then shouldn’t Samsung, Apple and Google stop with the “derivative releases” that happen every year? Let’s not be hypocritical here. The Note and the S series are not derivatives of each other. Same thing with the Pixel phones. HTC built the first set, LG built the 2 XL while HTC built the smaller one, and Apple released a traditional iPhone with the 8 and a new design with the X. So does aren't that much of a derivative. Let's not just toss out random nonsense and expect it to be taken seriously. Who said the Note and S series are derivatives if each other? Pay attention. The S8/S8+ and the S9/S9+ are derivatives of each other. Same thing for the Pixels. It doesn’t matter who built them. The iPhone 8/8+ are derivatives of the iPhone 7/7+, just like the iPhones XS/XS Max are derivatives of the iPhone X. Stop trying to move the goalposts and change the facts to suit your false narrative. It’s one of the main reasons why you haven’t been taken seriously around here since your mxyzptlk account. Stop crying just because I took your point and tore it to shreds like Gordon Ramsey in a crappy restaurant. I don't have to resort to your tactics of changing the scenario just because I don't have a valid counterclaim. Once again you show that you lack the genius part your name. Maybe you should have stayed being a geek. So you have documented proof that “everyone is getting tired and moving on” and that “Nokia is going to fall short”? By the way, it’s HMD, not Nokia that’s making Nokia branded smartphones, and their growing sales and market share prove that people aren’t moving on. Documented growth in sales and market share trump your anecdotal evidence any day of the week. So yeah, you need documented proof that “everyone is getting tired and moving on” and “Nokia is going to fall short”, especially since the phone hasn’t been released yet. Well said. They waited too long to get this phone out onto the market. They are taking their time to get it right. It’s clearly not causing them to lose sales or market share, as that is growing. A top 10 global smartphone manufacturer in just 2 years is pretty impressive for a new company like HMD. Ok, and? Doesn't really change the point of what we said. Actually, it does, and you can’t stand it. Why would they wait for 5G when Nokia themselves is involved in the launch of 5G, and HMD is making Nokia branded smartphones? Did you even know that? I don’t think so, or you would have rethought your comment. And their sales and market share growth prove you wrong. And If they are taking their time to get it right, their better not be any hiccups or imperfections otherwise all you are going to be reading all of the critics reviews " We waited this long for this"
There are critics of everything, whether it’s good or not. This comments section is indicative of that.